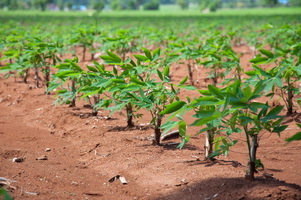 Cassava's increasing economic importance but difficulty to improve genetically are what motivated scientist Herve Vanderschuren from Institute of Molecular Plant Biology in Switzerland and colleagues to utilize genome editing to accelerate breeding for modified starch in cassava. Cassava plays a big role as a staple food and a highly favored commodity in the multibillion starch industry. However, its genetic improvement is hindered by its recalcitrance to genetic transformation and in vitro regeneration, poor fertility of farmer-preferred varieties, difficulty to breed conventionally, and rare flowering in glasshouse environments. In the study by Vanderschuren and colleagues, they used CRISPR-Cas9 to edit genes controlling flowering (FLOWERING LOCUS T) and amylose production (GBSS and PTST1). Results showed reduced or eliminated amylose content in cassava starch. Such starch quality is favored by farmers and consumers due to its low pasting temperature and high viscosity. Modification of the flowering gene allowed them to hasten flowering, thereby accelerating selection for transgene-free edited plants. The next step of the research is the production of more seeds of these mutants for future characterization and breeding in the field. For more information, read the article in Science Advances.